The blue whale: the biggest animal on earth. The blue whale is one of nature’s most magnificent and graceful beings. Louder, larger, longer and heavier than any other animal and with the biggest brain, it’s a multi-record breaker and a totem of conservation for all whales and dolphins. We must ask ourselves: if we can’t save the blue whale, what hope is there? What do blue whales look like? The gentle giant of the sea, the blue whale is instantly recognisable with a long, streamlined shape, mottled blue or grey back and pale underbelly. They each have huge heads that are broad, long and have a unique U-shaped arch, and can reach up to a quarter of their body lengths in size. Famous for their sheer mass, blue whales glide effortlessly through the ocean, dwarfing all else in their path. Commanding awe, they grow to over 33 meters long (around 100ft) – twice as along as a T-Rex dinosaur. Even their calves are a whopping 7 meters in length, weighing in the same as an adult African elephant. What’s life like for a blue whale? Life for a blue whale should be quite long. A normal life span is 80 or 90 years, though one famous whale lived for 110 years. 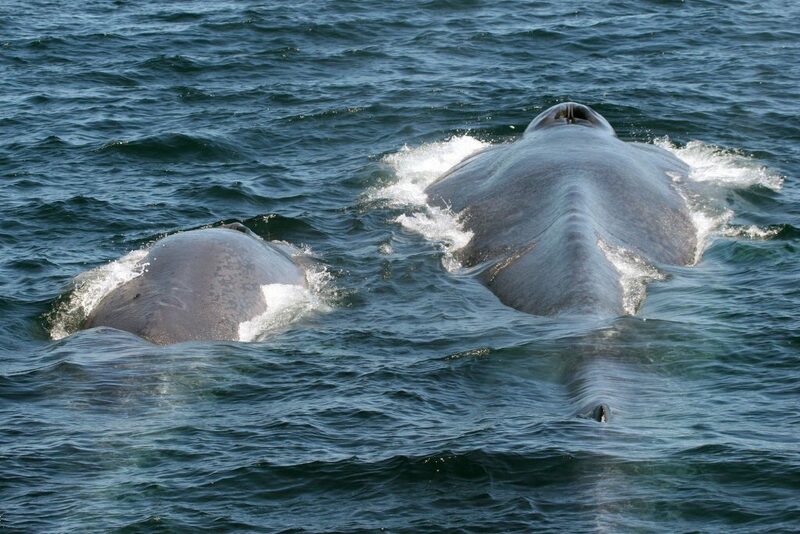 Reproducing once every two or three years, female blue whales carry their young for 12 months before giving birth. Maintaining a strong bond, young calves stay close to their mother’s side for around six months before being weaned. Learning and growing is thirsty business for a baby blue whale, they can drink up to 500 litres of milk every day. Blue whales are also great travellers and pods undertake an endless cycle of migration, heading to cold waters to feed and then warmer waters to breed and look after their young. They eat very little en route and survive mostly on their blubber reserves, for up to four months at a time. 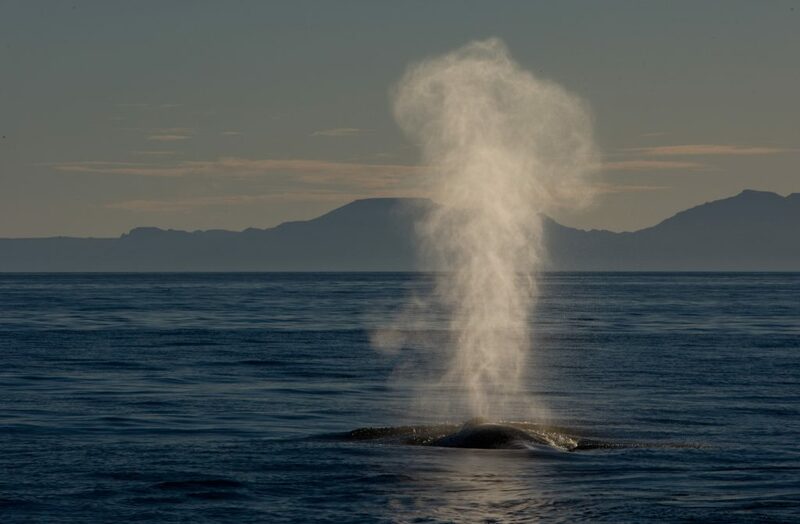 Whether they are traveling or not, blue whales like to communicate with each other. Sometimes, they talk to each other over hundreds of miles producing songs and sounds of up to 188 decibels. That’s louder than a jet plane! Ironically, the largest animal on the planet survives by eating one of the smallest. Feasting mostly on krill – a tiny shrimp like creature found in great clouds in the ocean – blue whales can eat as many as 40 million a day. Scooping them up in huge mouthfuls of water, they filter out the krill from the seawater through curtain-like teeth known as baleen, releasing the water back into the sea. Although once upon a time there may have been over 350,000 blue whales in our oceans, pre-industrial hunting decimated their populations and now there are only between 10,000 and 25,000 left. 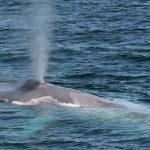 Preferring to live in deep ocean, blue whales are rarely seen close to shore. In the Northern Hemisphere, they can be seen in the northeast Pacific, from Alaska to Costa Rica, and migrate towards the northwest of the Pacific too. In the North Atlantic Ocean, blue whales can be found near Greenland, Newfoundland and Nova Scotia. 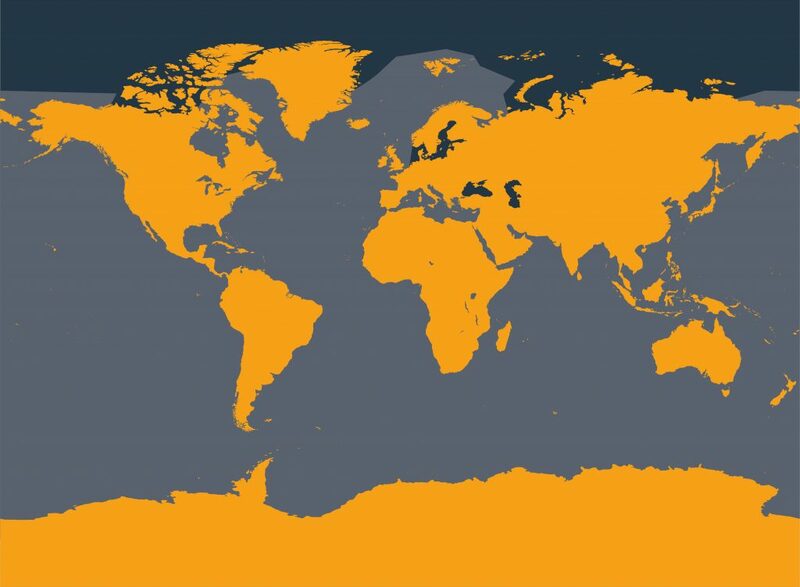 In the Southern Hemisphere, small populations remain in the Antarctic, as well as parts of the Indian Ocean. A blue whale can eat 40 million krill every day. A calf drinks over 500 litres of milk each day. The major blood vessel of a blue whale’s heart is so big that a human baby could crawl through it. The plight of the blue whale helped to kick start the ‘Save the Whale’ campaign. Since then, the blue whale has become a totem for the whole conservation movement. It has been asked: if we can’t save the largest animal with the biggest brain what hope do we have? First overlooked by whalers, the blue whale was simply too large and too difficult to hunt. Unfortunately, this dilemma didn’t last very long and in the 1860’s boats and harpoons were designed specifically to capture large whales and put into production. The decades that followed almost exterminated the blue whale. It was only in the 1960's, 100 years later, that the world woke up to their plight. The sci-fi author Arthur C. Clarke drew attention to the large brain of the blue whale saying: “we do not know the true nature of the entity we are destroying”. The ban on hunting blue whales came into play in 1966, some 20 years before the general moratorium on whaling. But, it wasn’t until the 1970’s that the Soviet Union actually stopped hunting them. Whaling decimated the blue whale population and only a fragment survive today. Whaling may have stopped but many other human activities still threaten their existence. Hunting – though they are not currently hunted, whalers are constantly pushing for reprieve and pose a constant risk, trying to wrangle so-called sustainable hunting. Pirate whaling is also a threat. 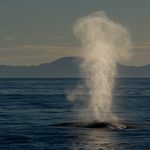 Pollution – increasingly plagued by the build up of toxic chemicals from plastic, litter and oil spills in their systems, the health and fertility of large whales could be seriously comprised by pollution. 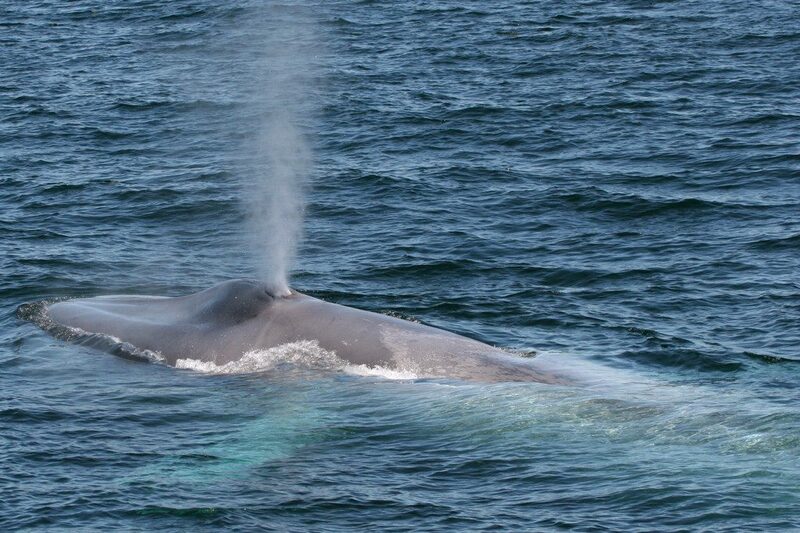 Noise pollution – blue whales rely on sound to navigate and communicate. Noise from military sonar, oil and gas drilling and exploration and shipping can seriously disrupt them and even cause them to strand. Fishing nets and gear - trawl nets are pulled by boats, static nets hang in the water; both catch everyone and everything in their path and are a massive threat to blue whales. Vessel strikes – the number of boats on the ocean is increasing all the time. Though they are large, blue whales are relatively slow and are vulnerable to strikes by many kinds of vessels. 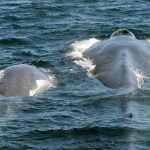 Irresponsible whale watching – their size and fame make blue whales very popular with whale watchers, but unfortunately in some parts of the world boats are getting too close and interfering with their lives and natural behaviours.